Through a series of six cases, the school will highlight and discuss in detail some of the complicated nuances in the management of the modern liver transplant recipient throughout their journey from assessment, to the transplant procedure itself and then the immediate and long term management of the patients. Particular emphasis will be given to areas of uncertainty and the expert multidisciplinary faculty will be on hand to provide their personal experiences and opinions on these cases. The school will adopt the flipped classroom model. This is effectively learner centered and problem orientated. Attendees will be provided with materials 4 weeks prior to the school and will be expected to work in small groups to answer questions on the individual cases which will then be presented to the wider group on the second day of the school. 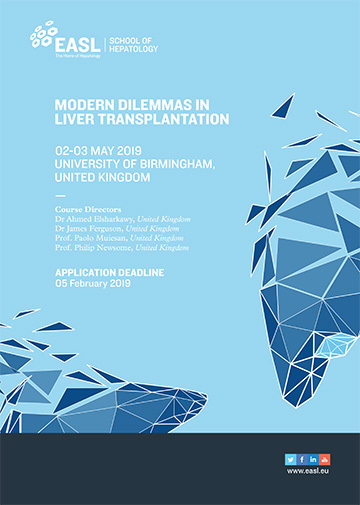 This course may also be of interest to liver transplant coordinators or other multidisciplinary professionals working in the liver transplant field.